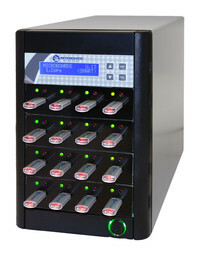 15-slot USB flash duplication tower, copy USB flash drives with a click of a button! Copy USB Flash drives in an instant with the Microboards CopyWriter Flash Duplicators. Available in 4, 8, or 12-slot configurations, users can make up to 15 copies at a time in a single system. Making copies with the CopyWriter Flash Duplicator is easy; simply insert your master USB Flash device and up to 11 blank devices, and then press the OK button. Capacities are not an issue; even the newest drives are supported! Asynchronous copying technology and a large memory cache allows for every slot operate independently. Copy jobs up to 256MB in size permit target devices to be unloaded and loaded on the fly: as soon as a slot signals ready, you can remove the finished, copied media and insert another blank device. Because these copiers operate without the help of a PC, they’re easy for anyone to use. Bit-level comparison ensures a successful copy every time. All current formats are supported, and the unit is backed by Microboards’ industry leading support with a one-year warranty and lifetime phone support. CopyWriter Flash Duplicators can also be used to erase content from flash devices, leaving you with a clean, unformatted device. As the cost of flash memory comes down, the distribution of information on flash becomes more and more viable for companies in the following areas: Marketing/Communications, Field Sales Support, Education, Government, Engineering, Audio/Video, and more! With the Microboards CopyWriter Flash Duplicator you have the ability to make multiple copies quickly, reliably and without effort. Pioneers in the field of disc technology, Microboards Technology has a long history and considerable expertise when it comes to delivering innovative, high-quality products and solutions customers can count on. The Microboards HCL Autoloader is one of those products that the industry has relied on for years because nothing else offers the shear capacity, reliability and throughput as the HCL Autoloader. When you need to burn a lot of BD-Rs and using a push button duplicator tower isn’t feasible, the HCL Autoloader is the simple choice. 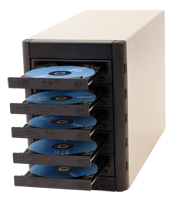 Available in multiple recorder configurations to fit anyone’s time requirements or budget, you can pick from 4 or 6-drive options – all featuring a staggering 1,000 disc capacity. Innovative solutions to industry problems are found throughout the HCL Autoloader including a disc counter that tracks the number of good discs completed per job so you know exactly how many discs are actually complete. Just because you can’t keep loading additional jobs when the last one finishes doesn’t mean the HCL Autoloader should stop working. Store and queue multiple jobs for uninterrupted disc production. Don’t let a bad batch of discs slow down your production. A sticky disc separator option provides an added layer of insurance by helping separate sticking discs, which normally is a fatal error for automated production systems. 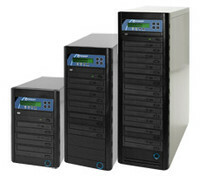 Available in multiple recorder configurations to fit anyone’s time requirements or budget, you can pick from 4 or 8-drive options, all featuring a staggering 1,000-disc capacity. Innovative solutions to common industry problems are corrected in the HCL Autoloader, including a disc counter that tracks the number of good/bad discs. Store and queue multiple jobs for uninterrupted disc production—don’t let a bad batch of discs slow down your production. A sticky disc separator option provides an added layer of insurance by helping separate those annoying sticky discs, which normally is a fatal error for unworthy automated production systems. 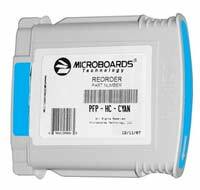 When you need lots of discs duplicated and you simply can't wait, the answer is simple—the Microboards HCL Autoloader. No external PC or wires to connect. Keep things simple. Plug it in, turn it on, and start duplicating CD-Rs, DVD-Rs, and DVD-RWs instantly. 7-slot USB flash duplication tower, copy USB flash drives with a click of a button! 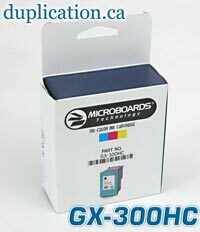 Copy USB Flash drives in an instant with the Microboards CopyWriter Flash Duplicators. Available in 4, 8, or 12-slot configurations, users can make up to 11 copies at a time in a single system. Making copies with the CopyWriter Flash Duplicator is easy; simply insert your master USB Flash device and up to 11 blank devices, and then press the OK button. Capacities are not an issue; even the newest drives are supported! Attach this tower to your PC and burn up to 5 Blu-ray discs in one pass! Attach this tower to your PC and burn up to 5 discs in one pass! What is your DVD Video worth? If it's substantial, Microboards' all-new CopyLock will help you protect it from being copied illegally. Video houses, government agencies, professional and amateur videographers—anyone selling their DVDs or protecting sensitive content will greatly benefit from CopyLock. CopyLock features technology that's easy to use and is offered as an option for Microboards' current lineup of premium CopyWriter Pro towers—DVD, LightScribe and Blu-ray (for DVD-Video protection only). It takes just six simple steps for creating a protected master and unlimited protected copies. 1) Load the supplied Microboards CopyLock software onto a suitable PC. 2) Plug in the CopyLock USB dongle with activated licenses into your PC’s USB port. 3) Use the Microboards CopyLock suite of software to create a protected .iso file from your DVD video disc or Video TS folder. 6) Initiate the copy process. The finished copied discs will have the copy protection embedded. One license per master is all that is required to embed your project/title with Microboards CopyLock protection. The CopyLock software allows the user to create an unlimited number of copies from each licensed master video image for no additional fees, making the overall cost per copy protected disc as low as just pennies. Get in on the ground floor of high-def duplication with this Networkable Blu-Ray Tower with 7 or 10 drives. Also does CD and DVD. 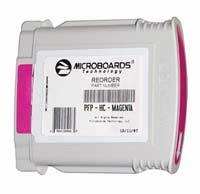 Microboards' Premium DVD Copiers feature high-speed, industrial recorders that copy both DVD and CD formats. 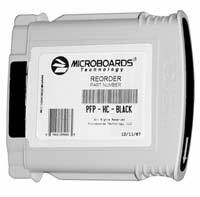 In addition, Microboards' Tower duplicators use a unique high-quality controller available only through Microboards. That's why Microboards always supports the latest record speeds and has the best track record in the industry! All the Copywriter Pro features plus built-in ethernet network connectivity. Contact us for a custom quote on this item. Features in the form factor you need – a 19” rack mount. The CopyWriter Pro rack mount offers a 160 GB hard disk to store disc images and extract audio tracks. Adjustable record speeds, verification mode and the ability to record to CD-R(W), DVD-R(W), DVD+R(W), and DVD-DL allow you to handle nearly any record project. New Multi-Tower Configurations allow up to 25 or more CopyWriter DVD towers to be daisy-chained together. DVD-PRM NET-10 is an additional ten-recorder tower which includes cables to connect to other NET-20 or NET-10 systems. New Multi-Tower Configurations allow up to 25 or more CopyWriter DVD towers to be daisy-chained together. DVD-PRM NET-20 is a two-tower configuration daisy-chained together. Ink Filtration Foams for your CX1, DX1, DX2, MX1, MX2, PF2, PF3 disc printer. 10 foam filters per pack.